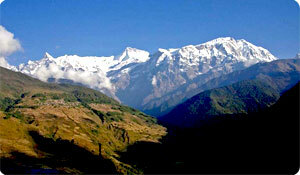 Lamjung Himal Trekking offers an impressive view of the central Himalaya. They journey traverses 4,000m. above the Marsyangdi gorge and quite near the Lamjung Himal. Between Kathmandu and Pokhara are three major groups of peaks: Ganesh Himal, Manaslu and Himal Chuli; and the large Annapurna Himal. Lamjung Himal trek is recommended by many trekkers, at a convenient distance from Kathmandu and famous for the Tamang culture, spectacular views of mountains & rhododendron forestsThe view of the Manaslu west face, Peak 29, and Himalchuli are the highlights on this trip. Day 01: Arrival in kathmandu 1334m, transfer to hotel , Lamjung Himal trekking briefing with officially arrangements. overnight at kathmandu hotel. Day 03: Besi Sahar-Baglung Pani (1524m). Day 04: Baglung Pani-Ghanpokhara (1830m). Day 08: Rest day at Rambrong Danda. Day 11: Yanjakot-Modi Khola (750m). Day 12: Modi Khola-Kalikathan-Pokahara (915m). Day 14: After breakfast, our tour guide will take to for historical monuments sightseing in kathmandu valley such as Bhaktapur, Pasupatinath, Boudhhanath, Kathmandu durbar square and Monkey temple(swyambhunath) and in the evening farewell dinner in Restaurant, overnight at kathmandu in Hotel. Day 15: After breakfast, Relaxing/shopping with own activities than drop to Kathmandu international airport for onward journey.